The team arrived in the United States looking for a repeat performance of last year. The car was shaken down in the test session on Friday and Tom was ready for the Saturday Free Practices and Qualification. In Free Practice 1 Tom got off to a good start but a red flag came out quickly when Tom Coronel went off into the barriers. Tom set out again after the restart and 6 laps in posted a time of 1:47:132 to put him in 9th spot overall. The time could not be improved on but was a good start to the day. In FP2, the temperatures were building and Tom went out looking to improve still further. Another red flag interrupted the session as Monje went into the tyre wall. After the red flag, Tom went back out but the car seemed to have an issue with the power steering. He came back in for an adjustment and the issue seemed to be fixed. He could not improve on his time though from FP1. Qualification and the Tom set out to get the pace of FP1. Into his first flying lap Tom noticed that the steering issues had returned. He came in for the team to check out the issue and went out again but there was no change in the handling. Despite his best efforts, Tom could only post a time of 1:48:530 which put him down in 24th. With a number of penalties being handed out though, he would start both races down in 20th. Race Day and work would have to be done to get into the points. The team had worked to repair the steering issue and the warm up session confirmed that. After the pre-race opening ceremony the cars lined up in 40 degree heat. Tom got off to a good start and made up 4 places. He was now chasing down Darryl O’Young, and on lap two he passed after Darryl spun out. He then chased down the Lada of James Thompson and passed him going into the chicane. A gap now existed between Tom and Pepe Oriola in his Chevrolet Cruze. Over the next 5 laps Tom closed the gap and ended up on his tail with 3 laps to go. Despite his best efforts he could not pass the Spaniard and would finish in 12th, P4 independent. Into Race two and a repeat performance was required. Off the standing start Tom in usually very quick. On this occasion though he failed to properly see the lights and thus got off to a slow start and found himself at the back. After the first lap he was back in 20th again though but as he went to overtake Hugo Valente, on the pit straight, the Frenchman failed to see Tom and moved across and hit him. Tom sustained and puncture and had to limp around the track to come in for a new tyre. This effectively ended the race and Tom retired on the 11th lap after an engine issue materialised. 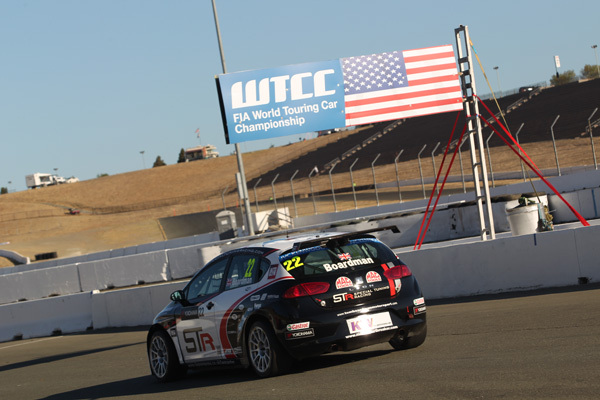 The team now travel to Suzuka in Japan for the 19th and 20th rounds of the WTCC.